The Trag'Oul's Avatar Set Dungeon is located in Act IV, the Upper Realm of Cursed Fate. Use the waypoint to that area, walk down the stairs and take a left turn. Walk further down the path; just as it starts branching off, the portal for the Set Dungeon will appear (as long as you have the 6-piece Trag'Oul set bonus active). The Trag'Oul's Avatar Set Dungeon's two unique Primary Objectives are to: 1) Spend 1,000% of your life on abilities; and 2) Heal 1,000% of your life with abilities. The Grace of Inarius Set Dungeon is a Temple of the Firstborn tileset of a relatively small size. 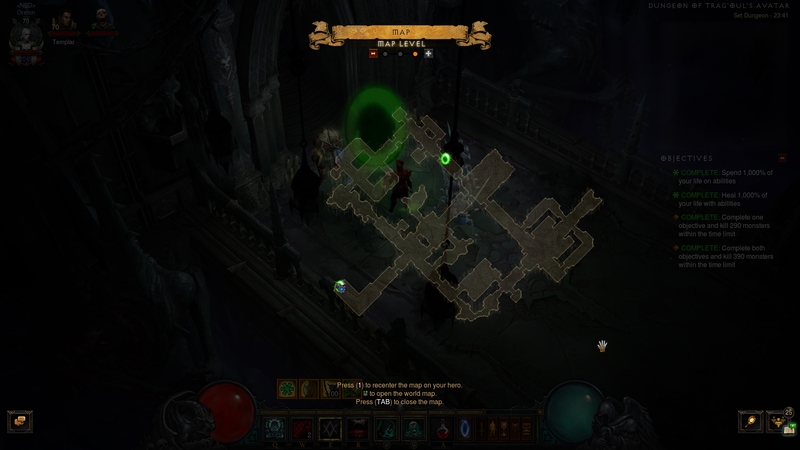 There is no predetermined path required to clear this challenge — simply note the dungeon's rough 8-shape and clear the dungeon in one weaving run, starting in any direction you choose. Hematic Disciples, Hematic Priests and Tomb Roaches — the fuel for the objectives in this Set Dungeon. You will cut through swathes of them using your Blood Mages and regaining life by Devouring their numerous corpses. Aberrant Horror — the unique enemies of the map. They resemble Act II's Wretched Host trash, but also have the Arcane Enchanted and Reflect Damage affixes. Neither of those affixes nor the elites themselves will pose any significant threat to you. The Trag'Oul Set Dungeon is very trivial to achieve mastery in; simply use the Trag'Oul Blood Mages build here on Icy Veins and make a few adaptations to suit the Objectives. Due to the low damage requirements of the dungeon, you will not suffer the loss of damage from Tasker and Theo in the Cube by swapping the slot to Requiem Cereplate. Gold-related legendaries like Goldwrap and Avarice Band should also give way to more generic utility items like Dayntee's Binding and Convention of Elements. With those adjustments made, the 2nd Objective will fulfill itself within the first 30 seconds of the attempt, likely as early as the first big fight, leaving you to deal only with the 1st Objective. With the abundance of Corpses for health restoration in the dungeon, you are free to spam Skeletal Mage Life Support to gain progress in big chunks. When properly executed, the 1st Objective will also be done halfway through the dungeon. 04 Mar. 2018: Added guide.